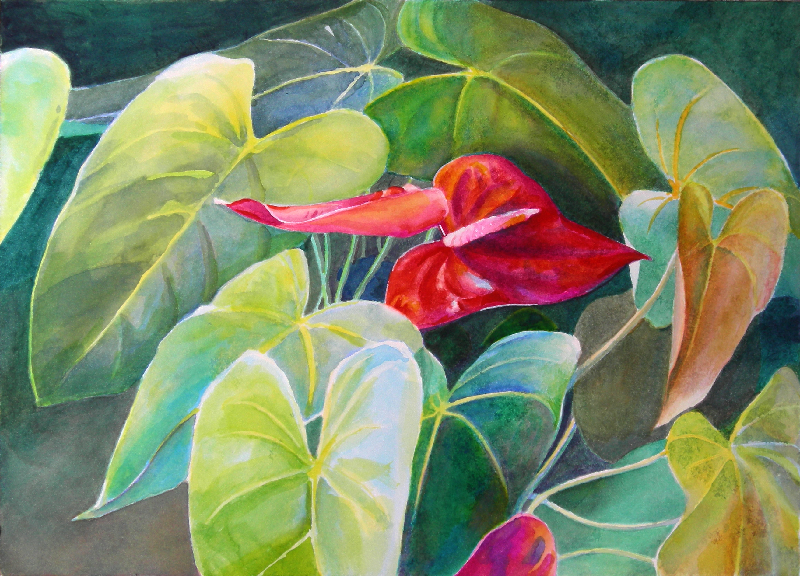 Pukalani Anthurium was painted in the same sitting location as the King and Queen of the W. Maui mountains. 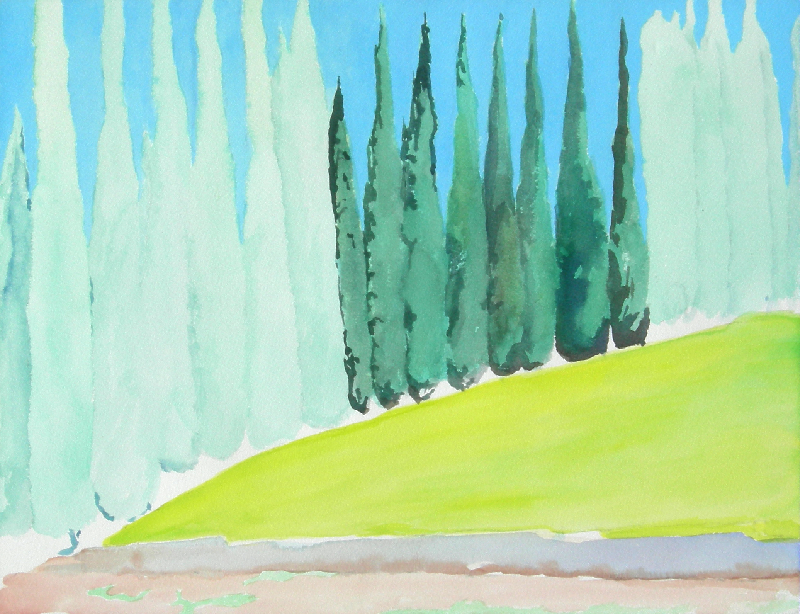 Cypress Trees is painted from the head of their driveway. 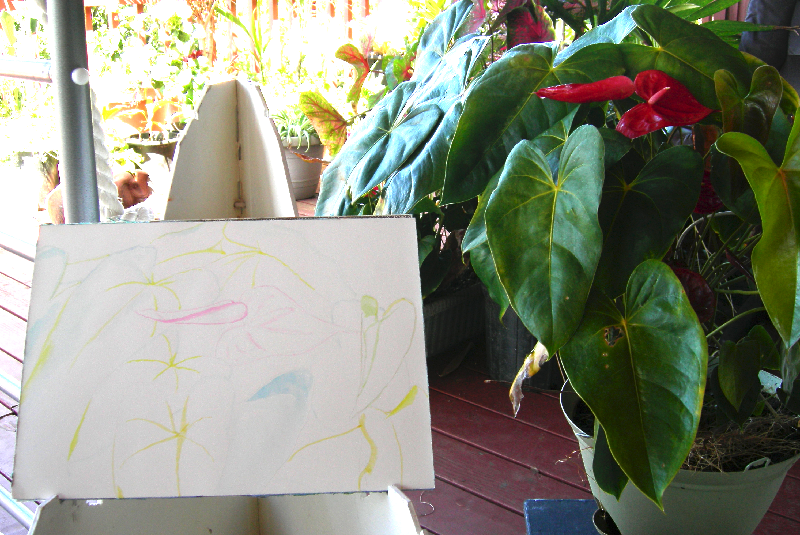 10-13-10, Today I started two watercolors, the anthuriums are on Arches 140# HP. I wanted to do a fast one but it didn't work out that way. So here are the first and second days progression. I should have taken more time on the drawing.. and finished painting the orange leaf. The next day it was a fully opened leaf and a completely different color. 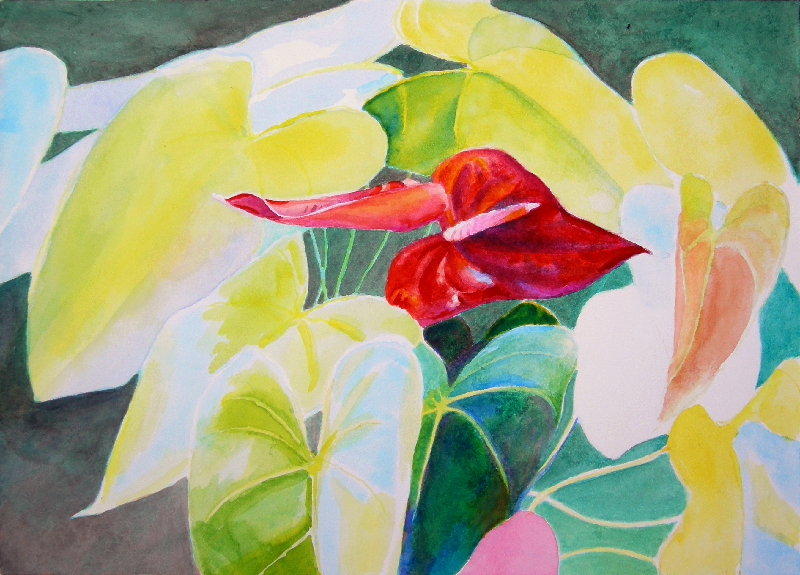 10-20-10, I finished the anthurium painting today. To my surprise a young leaf showed up where the other young leaf was, hooray! I'm happy because after the first day the leaf changes color as well as size. Well I had the size but I needed the colors. 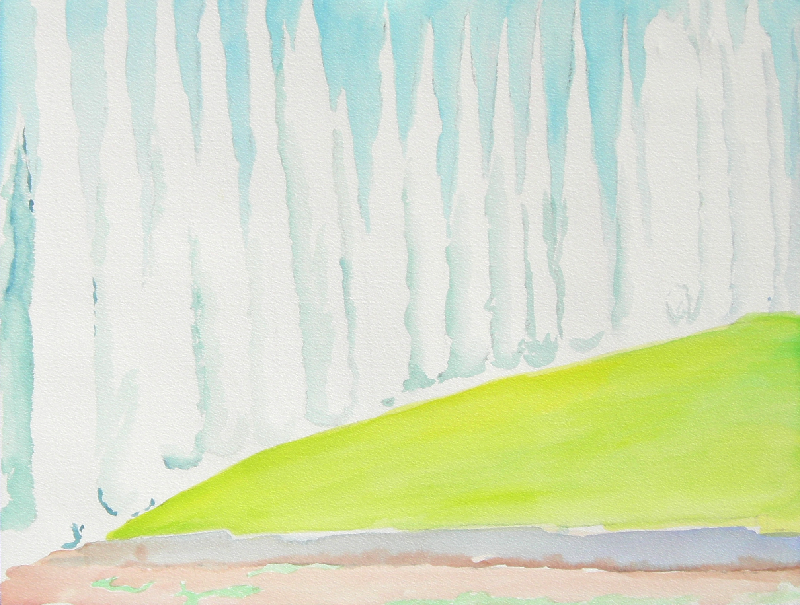 The sun was shinning so I never got to touch the cypress tree painting. Another good thing happened, Julie's acrylic paints arrived today, $400.00 dollars worth. I chose the colors so they match mine. Thirty-two 60mm tubes. I'm so jealous. Here is the inventory list, they are all Old Holland's brand from Art Warehouse. This is the list of pigments I would recommend for anyone just buying acrylics but accomplished in another medium, like oil. It's a professional set of colors I know she is going to enjoy. 10-13-10, Day one and two of the cypress trees. 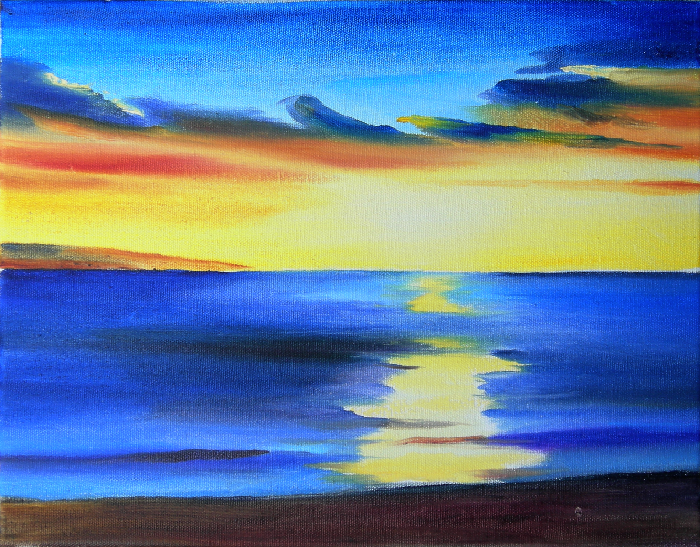 3 color oil painting of a sunset. This is the first step, the colors have no overlap. It should dry before I tighten it up. I may never finish this one, it was just a color example for Julie and her two boys showing the fastest way to paint. 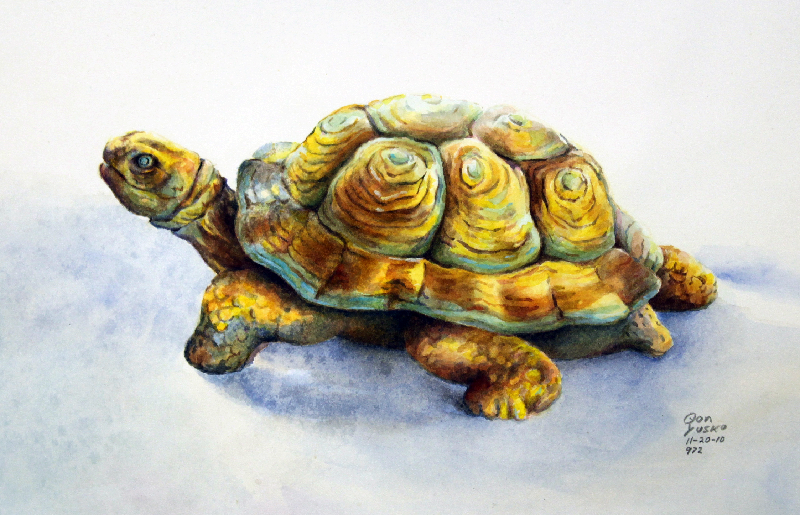 3 color watercolor paintings of the porch turtle. 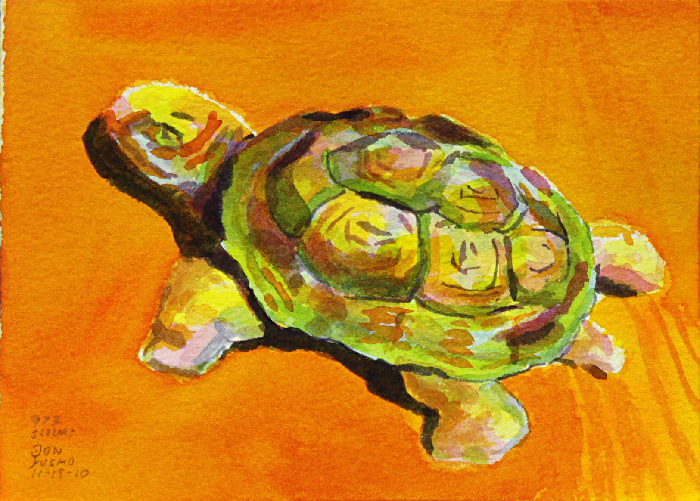 The orange sunlit turtle was painted without pencil lines. I should have put in at least 3 marker points first. But I was influenced by a Painting on Location with Color forum artist named Paint Fox who paints with acrylics very fast. 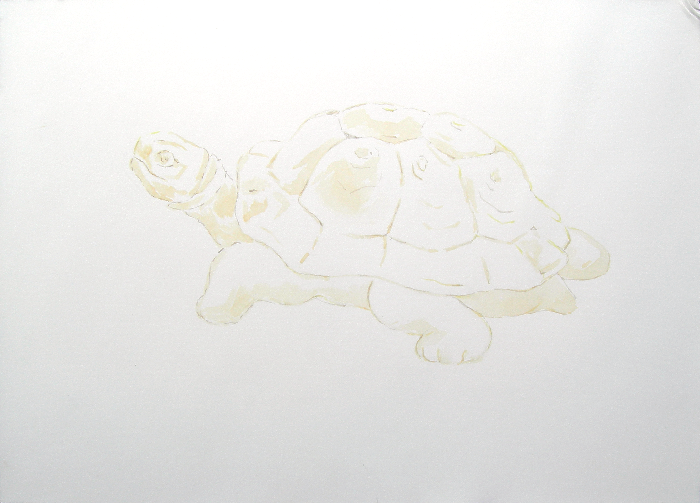 The second turtle took much longer, it also was painted with only 3 colors but had a detailed drawing at the start. It shouldn't have taken 12 hours, but it did.